Linlithgow Rose midfielder Blair Batchelor claimed their performance was one of the worst he has been a part of at the club as the Prestonfield men lumbered into the second round of the William Hill Scottish Cup. The 3-0 scoreline would suggest Linlithgow enjoyed a routine victory over the Highland League’s bottom club, who came into the tie having conceded over 80 goals in just ten league matches so far this season. It was anything but. 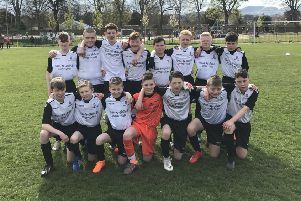 Rose have fond memories of the Scottish Cup – they became first Junior club to reach the fifth round three seasons ago when they drove then Premiership club Ross County close in Dingwall. Performances will have to improve drastically, however, if they have any hope of reaching those levels, with an away trip to Beith Juniors next up. “That was poor, very very poor. It was probably one the worst. We’ve not had a great start to the season, but that was really bad,” said stand-in captain Batchelor. “The gaffer [Mark Bradley] went mental at half-time and rightfully so. It needs to be better than that – we were just slow and lethargic, and there was a lack of movement. It wasn’t good enough. “It could be a problem when we are turning up against some of these unknown teams that players think the game is already won. We played Inverkeithing – who aren’t any better – than them and we beat them 10-0. We should be coming here, and no disrespect to Fort William, we should be taking double figures off them if teams in the Highland League are doing that. “We need to have more about us. I think it starts a lot with our movement. A lack of movement up front and from midfield has kind of been the story of our season so far. Teams couldn’t live with us at points last season when there was boys moving everywhere and that’s what we need to start doing again. Rose were camped inside their opponents half from the get-go as Fort invited the home side to attack with a flat back-five set out to limit the damage. There was no damage done in the opening period, however, with Rose testing goalkeeper Mateusz Kulbacki sporadically as they passed the ball between themselves without conviction. It was the visitors who went closest after the interval with Rose given a big let off as neither Jordan Morrison or Josh Knowles could stab home Scott Hunter’s cross from the right as home keeper Kyle Marley could only watch on. Rose finally breached Fort’s defensive line when striker Tommy Coyne threaded the ball through for Kevin Watt, who went one-on-one with Kulbacki. The keeper lost sense of where he was as he handled outside the area, with referee Jordan Paterson flashing his red card. Substitute keeper Callum Ligertwood made an instant impact as he turned Robert Sloan’s net bound free-kick round the post. The introduction of Owen Ronald and Colin Strickland would provide Rose with the spark to finally breach visiting lines, with the former crossing for Coyne just three minutes after coming on to net his 301st goal in maroon. Their passage to the second round wasn’t secured until two minutes to go, with Sloan curling a fine effort into the bottom corner, before Kyle Turnbull tapped in from Ronald’s low cross. Rose boss Bradley blasted his side for their lack of ruthlessness. “I know we have won and we are through but 3-0 papered over the cracks a wee bit,” he said. “It wasn’t good enough at all, and quite embarrassing to be honest. Other teams would’ve won that game, eight, nine or ten nil. “We’ve not got that arrogance about us yet, which is frustrating the life out of me. We need to start putting teams to bed early doors, because to be a team which is going to go far and win something, you need to have a cutting edge.